Summary. Parathyroid carcinoma (PC) is an uncommon cause of primary hyperparathyroidism (pHPT). The tumor is mostly functioning with following high serum calcium and parathyroid hormone (PTH) levels. Consideration of PC in differential diagnosis of pHPT is important because the mortality and the prognosis depend on early recognition and surgical approach. A case of PC in 51-year old female patient with persistent pHPT is reported. 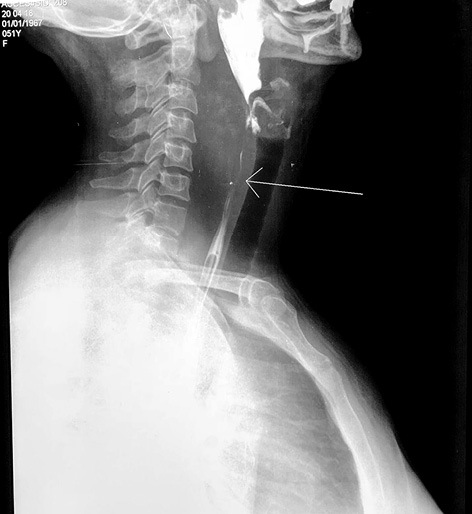 A patient, referred with anterior cervical hematoma, dysphagia, underwent neck ultrasound, barium X-ray swallow test and neck computed tomography. On the posterior surface of left thyroid lobe, close to the esophagus the heterogenic lesion with irregular margins was found. The preoperative calcemia was slightly elevated. The patient underwent cervical exploration with parathyroidectomy. Histological exam showed parathyroid lesion with immunohistochemical confirmation of PC. After 2 months follow-up there are no signs of a residual-recurrent disease. Although laboratory tests revealed pHPT preoperatively, no clinical effects of elevated calcium and PTH concentration levels were presented. As histological features are not specific for the differential diagnosis between the parathyroid adenoma and PC, the immunohistochemistry remains the only useful tool for the definite diagnosis. Abbreviations used: PC — parathyroid carcinoma; PTH — parathyroid hormone; pHPT — primary hyperparathyroidism; US — ultrasonography. Parathyroid cancer is extremely rare endocrine malignancy with the reported incidence less than 1% of primary hyperparathyroidism (pHPT) cases [1, 2]. PC is usually a sporadic disease, but it also has been reported in familial pHPT as hyperparathyroidism-jaw tumor syndrome and in multiple endocrine neoplasia type 1 . The tumor is mostly functioning; patients usually present elevated blood serum calcium and parathyroid hormone (PTH) levels. Thus, functional carcinoma causes signs of bone and kidney disease. The management of PC is mostly surgical, including en bloc resection of the parathyroid with involved adjacent structures [3, 4]. According to the Surgical CAse REport (SCARE) Guidelines criteria, we report a case of parathyroid carcinoma (PC) in patient with persistent pHPT . A 51-year-old female was admitted to the surgical department of State Scientific Institution “Scientific-Practical Centre of Preventive and Clinical Medicine” of the State Administration of Affairs, Kyiv, Ukraine, with previous medical history of sudden pain in anterior neck region, sore throat and anterior cervical hematoma without any signs of trauma or injury. She complained of difficulty swallowing mostly at night. She had no family history of metabolic diseases. Physical examination revealed enlarged thyroid gland with two palpable thyroid isthmus nodules. Laboratory data showed increased serum concentrations of PTH (210 pg/ml [normal range, 15–65 pg/ml]) and Ca2+ (1.47 mmol/l [normal range, 1.09–1.35 mmol/l], phosphorus 1.11 mmol/l (normal range, 0.78–1.65 mmol/l), albumin 5.7 g/dl (normal range, 3.5–5.0 g/dl), magnesium 0.87 mmol/l (normal range, 0.6–1.1 mmol/l). Neck ultrasonography (US) was performed, which revealed an enlarged thyroid gland with two hypoechogenic isthmus masses sized 8 mm. On the posterior surface of left lobe, close to the esophagus the hete­rogenic lesion with irregular margins and approximate size 43 mm was visualized. Esophageal X-ray barium swallow test displayed an esophageal stenosis with swallowing impairment in the proximal cervical esophagus. Esophagogastroduodenoscopy visualized proximal cervical esophagus stricture with no signs of macroscopic changes of esophageal wall or tumor intergrowth (Fig. 1). Cervical positron emission tomography — computed tomography (PET/CT) scan showed a fluorodeoxy­glucose-avid with approximately 45 mm in diameter. Corresponding to PET-CT scan findings, lymphoproliferative disorder, thyroid tumor, adenoma or cancer of parathyroid is suspected (Fig. 2). We set up the following preoperative diagnosis — retropharyngeal space tumor, PC. Therefore, the patient was referred for formal cervical exploration with parathyroidectomy. Upon the operation, the inferior left parathyroid was obtained, adherent to the posterior surface of left thyroid with presence of esophageal wall invasion. The gland was dissected from esophagus with the following high-frequency tissue welding and en bloc removal of gland with the left thyroid lobe all involved tissue. The left recurrent nerve was free of adjacent tumor masses. Superior and inferior right and superior left parathyroid were preserved. The intraoperative frozen-section pathological examination raised a suspicious of a PC or neuroendocrine tumor. On gross examination, the size of the specimen removed from the retropharyngeal space was 5.5 × 3.5 × 2.1 cm. The mass was found to be a grey-pink tumor. The cut surface was mostly occupied by a hete­rogeneous whitish nodule with focuses of hemorrhage and necrosis within the mass. On microscopic examination the neoplasm of retropharyngeal space showed an encapsulated nodular tumor with partial capsular invasion, and extension to the thyroid, esophagus and cervical soft tissue. 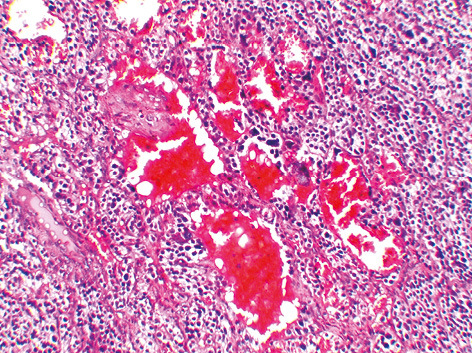 Areas of tumor necrosis were noted (Fig. 3). The tumor had a mixed structure and was formed by the main cells of the parathyroid gland. The areas of trabecular structure, separated by wide fibrous strands (Fig. 4), as well as the zones of solid structure were determined (Fig. 5). The areas of angioinvasion were noted (Fig. 5). The tumor cells were monomorphic with a light cytoplasm, and in the nuclei of cells, mitosis and polymorphism was defined. Immunostaining for thyroid transcription factor (TTF-1) (8G7G3/1) was negative, whereas staining for chromogranin A (DAK-A3) (Fig. 6), pancytokeratin (AE1 and AE3) and PTH showed a strong activity (Fig. 7). 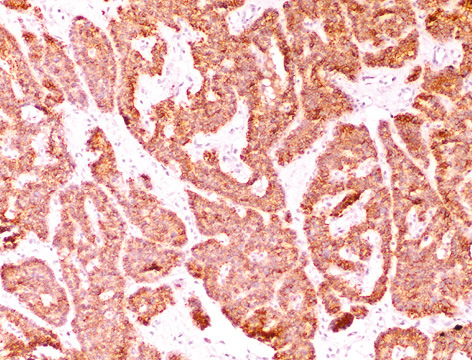 Based on the light microscopic findings, immunohistochemical profile, the tumor was diagnosed as a PC. Postoperative PTH (66.1 pg/ml), serum Ca2+ (1.18 mmol/l) and phosphate (1.01 mmol/l) levels were in the normal range. She was discharged home uneventful at the 5th postoperative day. At 2-month follow-up, the patient is asymptomatic with normal serum calcium level. 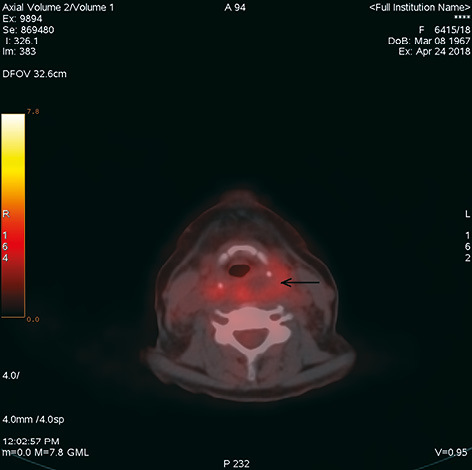 Neck US and total body computed tomography scan were negative for local and distant metastatic disease. In order to exclude a familial form of pHPT the screening of serum calcium and neck ultrasound in the first-degree relatives was normal. PC accounts for approximately 1% of all cases of pHPT and typically presents with very high PTH and calcium levels [6, 7]. The clinical diagnosis is often difficult and is obtained only after a postoperative histopathological examination including immunohistochemical profile [6, 8]. As in the present case, the histological diagnosis is challenging and immunohistochemical studies for PTH, thyroglobulin, thyroid trans­cription factor 1, and calcitonin are usually performed to establish the definitive diagnosis . We describe a patient with retropharyngeal space nodule adherent to the posteior surface of left thyroid lobe and to the esophagus which was discovered at cervical US primarily due to complaints of dysphagia, cervical hematoma and sore throat. After laboratory data had showed slightly increased serum concentration of PTH and calcium, in addition to performed cervical US our patient underwent 4-dimensional CT which is recognized the most cost-effective strategy in guiding principles of parathyroid imaging [6, 9, 10]. Moreover, neck US may fail when it has an ectopic location or located within the thyroid, as reported [3, 6]. In experienced hand, the average serum calcium level in patients with PC is higher (15.9 mg/dl) than that reported in patients with parathyroid adenomas (12 mg/dl) . Only 10% of patients with PC tend to have serum calcium level less than 13 mg/ml, so did our patient. Based on the US, PET/CT imaging findings pointing to esophagus involement, esophagogastroscopy, barium X-ray were determined in order to exclude organic changes of esophagus mucosa, the appropriate level of esophagus constriction and any contradictions for parathyroidectomy. According to AAES guidelines, personal and family history was taken in order to exclude inherited syndrome and abdominal imaging was performed for detection of nephrocalcinosis or silent nephrolithiasis [6, 7, 11]. Preoperative parathyroid biopsy has been avoided as well. Fine-needle aspiration cytology is not recommended due to both the high probability of false negatives (because of presence of some morphological similarities between thyroid nodule and parathyroid ade­noma) and to the obvious disruption of the neoplastic capsule with subsequent neoplastic spread [3, 12]. At surgery, the intraoperative frozen-section pathology suggested that the resected lesion had either parathyroid or neuroendocrine origin, but in order to approve the definitive diagnosis postoperative histology and immunohistochemical studies were required. The majority of studies recommend en bloc resection of the parathyroid tumor together with the ipsilateral thyroid lobe, and excision of the adjacent structures involved [6, 8]. Thus, this offers the best opportunity for local disease and metastatic disease control and significantly improves long-term survival. As the diagnosis of PC was not confirmed intraoperatively and no macroscopic signs of infiltrated lymph nodes were found, the surgical procedure was limited to left hemithyroidectomy. Lately, the diagnosis of PC was confirmed by definitive histology and immunohistochemistry. Our case of PC was one of 1% cases of pHPT reported in the literature. In our patient PC was considered as functional tumor with slightly increased serum concentration of PTH and calcium level. The main signs and symptoms due to high calcium and PTH levels include pathological fractures, joint and bone pain, fatigue, polyuria and polydipsia, kidney stones, muscular asthenia, nausea, vomiting, loss of appetite and weight loss . On second thought, there were no signs of pHPT with solely symptoms of local growth invasion (neck mass, hoarseness, dysphagia) which usually presents in non-functional carcinomas and makes definitive diagnosis challenging [3, 14]. The purpose of operation is not only oncological but also endocrine function control option. In particularly, the morbidity and mortality associated with PC are related to PTH hypersecretion and severe persistent hypercalcemia than oncological aspects . Thus, prophylactic central or lateral neck dissection should not be performed for PC routinely [6, 7]. 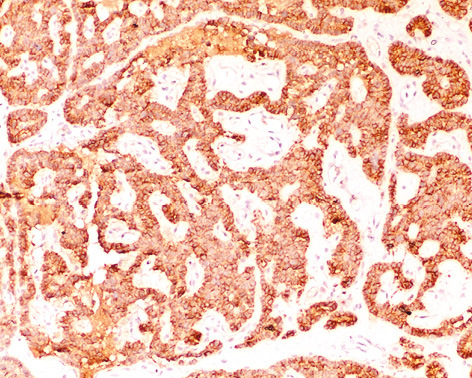 The immunohistochemical finding of PTH protein in tumor confirms its parathyroid origin as well as its ability to transcribe the PTH mRNA . Unfortunately, fresh-frozen tissue is unavailable for preoperative mRNA analysis. The histological diagnosis of PC is currently restricted to lesions showing unequivocal extra-parathyroid growth with extratumoral vascular, perineural or capsular invasion, ingowth into adjacent tissues, or metastasis [15, 16]. In the tumor of our patient, the histological criteria were evidenced, especially by presentation of esophageal wall ingrowth. Positive staining of chromogranin A and synaptophysin and negative staining of thyroglobulin have been used for further diagnostic accuracy improvement. In the absence of a gold standard test, a multidisciplinary approach, considering all clinical, biochemical and structural aspects of the disease, offers the best chance for accurate diagnosis. Adjuvant external beam radiotherapy should not be routinely performed after surgical resection of PC and is reserved as a palliative option [6–8]. Patients undergoing parathyroid surgery for functional PC undergo regular serum calcium and PTH testing to control and manage symptomatic hypocalcemia [6, 17]. Long-term follow-up and information on mortality are still required, but the advanced stage of the PC likely predicts a poor prognosis [18, 19]. The aim of follow-up is early detection of potentially curable loco-regional recurrence or secondary tumors. Thus, it should include clinical examination with calcium levels and PTH monitored every 3 months for the first 3 years [6–8]. In conclusion, the real incidence of PC is difficult to establish, due to variable diagnostic criteria . An absence of specific histological features, which can be obtained in adenomas, should be taken into account. That’s why the tumor malignancy must be unequivocally confirmed after prolonged follow-up and proper evaluation of histological and clinical features [20, 21]. Marcocci C, Cetani F. Clinical practice. Primary hyperparathyroidism. N Engl J Med 2011; 365: 2389–97. Forde R, Mitchell A, Duncan K, et al. Parathyroid carcinoma: a case report and review of the literature. West Indian Med J 2015; 64: 305–8. Cetani F, Frustaci G, Torregrossa L, et al. 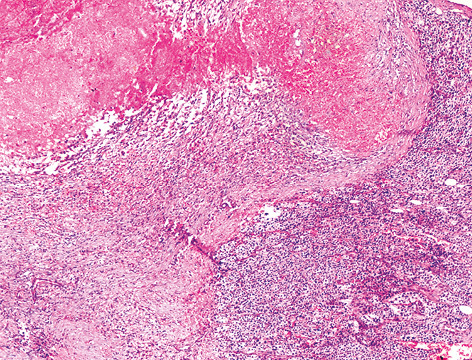 A nonfunctioning parathyroid carcinoma misdiagnosed as a follicular thyroid nodule. World J Surg Oncol 2015; 13: 270. Shane E. Clinical review 122: Parathyroid carcinoma. J Clin Endocrinol Metab 2001; 86: 485–93. Agha RA, Fowler AJ, Saeta A, et al. The SCARE Statement: Consensus-based surgical case report guidelines. Int J Surg 2016; 34: 180–6. Wilhelm SM, Wang TS, Ruan DT, et al. The American Association of Endocrine Surgeons Guidelines for definitive management of primary hyperparathyroidism. JAMA Surg 2016; 151: 959–68. Bilezikian JP, Brandi ML, Eastell R. Guidelines for the management of asymptomatic primary hyperparathyroidism: summary statement from the Fourth International Workshop. J Clin Endocrinol Metab 2014; 99: 3561–9. Fernandes JMP, Paiva C, Correia R. Parathyroid carcinoma: From a case report to a review of the literature. Int J Surg Case Rep 2018; 42: 214–7. Solorzano CC, Carneiro-Pla D. Minimizing cost and maximizing success in the preoperative localization strategy for primary hyperparathyroidism. Surg Clin North Am 2014; 94: 587–605. Lubitz CC, Hunter GJ, Hamberg LM, et al. Accuracy of 4-dimensional computed tomography in poorly localized patients with primary hyperparathyroidism. Surgery 2010; 148: 1129–37. Silverberg SJ, Clarke BL, Peacock M. Current issues in the presentation of asymptomatic primary hyperparathyroidism: proceedings of the Fourth International Workshop. J Clin Endocrinol Metab 2014; 99: 3580–94. Whitson BA, Broadie TA. Preoperative ultrasound and nuclear medicine studies improve the accuracy in localization of adenoma in hyperparathyroidism. Surg Today 2008; 38: 222–6. Sturniolo G, Gagliano E, Tonante A, et al. Parathyroid carcinoma: case report. G Chir 2013; 34: 170–2. Cocorullo G, Scerrino G, Melfa G, et al. Non-functioning parathyroid cystic tumour: malignant or not? Report of a case. G Chir 2017; 38: 243–9. DeLellis RA. Parathyroid tumors and related disorders. Mod Pathol 2011; 24: S78–93. Rodriguez C, Nadéri S, Hans C, et al. 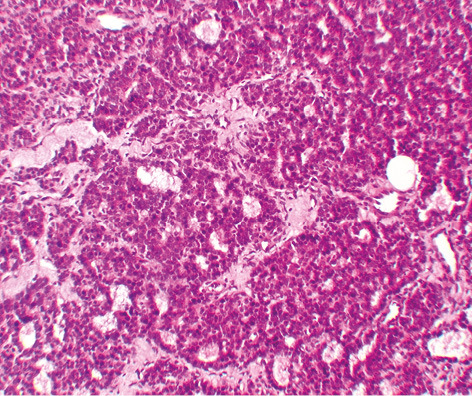 Parathyroid carcinoma: A difficult histological diagnosis. Eur Ann Otorhinolaryngol Head Neck Dis 2012; 129: 157–9. Udelsman R, Åkerström G, Biagini C, et al. The surgical management of asymptomatic primary hyperparathyroidism: proceedings of the Fourth International Workshop. J Clin Endocrinol Metab 2014; 99: 3595–606. Christakis I, Silva AM, Kwatampora LJ, et al. Oncologic progress for the treatment of parathyroid carcinoma is needed. J Surg Oncol 2016; 114: 708–13. Wang L, Han D, Chen W, et al. Non-functional parathyroid carcinoma: a case report and review of the literature. Cancer Biol Ther 2015; 16: 1569–76. Schulte KM, Gill AJ, Barczynski M, et al. Classification of parathyroid cancer. Ann Surg Oncol 2012; 19: 2620–8. Owen RP, Silver CE, Pellitteri PK, et al. Parathyroid carcinoma: a review. Head Neck 2011; 33: 429–36.